Sometimes, comic creators make “self-aware” stories which are removed from the fictional reality and take an outside-in look at their characters to convey a different kind of story. Paul Dini did this recently with his autobiographical Dark Night: A True Batman Story, but we’ve seen it in other DC projects like their brief late-90s “Realworlds” books and in some of the 9/11 aftermath short stories, or in Todd McFarlane and Dave Sim’s infamous comics creator Spawn story. 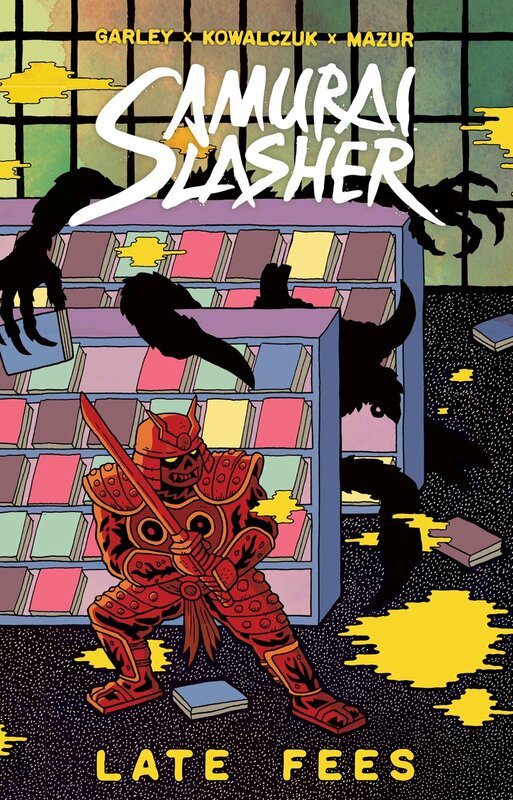 Samurai Slasher: Late Fees appears to be Mike Garley’s attempt at doing this kind of story. A self-billed “true story,” Late Fees is a spinoff of Garley’s 80s horror-killer indie title Samurai Slasher, but with that outside-looking-in perspective of a dad and his kid who develop a mutual love of the character through a forbidden video rental. The story is really about father-son relations and a child’s coming-of-age into manhood; the fictional Slasher story is just there to serve as the story’s lens through which the main character moves through life. What’s unclear is how much of the story is fiction and how much is fact. 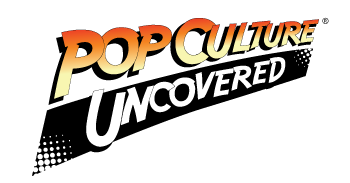 There’s a very clear overlayer of fiction: the story concerns a divorced father in the 1980s taking his split-custody son to “Shockbuster” Video where they engage in their weekly movie-rental ritual and discover the taboo world of horror films, namely through the fictional Samurai Slasher’s imagined B-grade film. It’s possible that “Shockbuster” and the nonexistent Samurai Slasher film notwithstanding, the rest of the story could be true, though the creators leave little explanation of what is and isn’t. The kid becomes enamored by the Slasher to the point where he imagines his entire life being an extension of the character…such that when the father has an unexpected health problem on the street, the kid envisions himself slaying demons as a proxy for phoning the paramedics. Late Fees deals heavily in intentional ambiguity: we are never quite clear what’s happening to the kid or his father, as Slasher-filled imagination masks too much of the kid’s real-world problems for visions of Samurai power-fantasy indugences. The kid’s aging into adulthood is envisioned as a struggle against the Samurai’s enemies, with monsters serving as metaphors for some kind of unsavory real-world people, we’re never quite clear on who. Indeed, the father’s problems–drugs, perhaps–are seen through the lens of some kind of Samurai trial, causing the kid to, briefly, leave the fantasy and take life as an adult. This ambiguity will either bother or entice the reader. It’s never entirely clear what’s going on in the real world: it’s just a given that the kid is experiencing some kind of human drama split with his father which is tempered only by escapism. But for readers who like to pick things apart, the answers are not forthcoming and Garley doesn’t provide any in a postscript. What does the mysterious contract in the middle of the story represent? What was the father’s problem? What drove him and the kid apart? Are “late fees” a metaphor for death, or something else? It may be that Late Fees is going for a Dark Night level of storytelling, but the message is, sadly, not particularly clear. However, Lukasz Kowalczuk provides the kind of indie art that’s appropriate to this kind of story, the kind of style that looks like it’d fit in a Fantagraphics project, but with an added degree of dynamism that would make Kirby blush. Kowalczuk uses that weird, cartoonish style of storytelling which works well in crafting the alter-fantasy world the kid inhabits, where horse-headed street gangs look entirely plausible given the subject matter. Late Fees is, if anything, eye candy for those who want a non-DC/Marvel style of story which is still grounded in basic, comptentent fundamentals of comic art. In sum, this story is a mixed bag: good indie art, but a story that’s crying out for explanation where none is present in the page itself. Perhaps Garley wants to leave it to the reader to project their own fears and fantasy struggles onto the page, though that may be a challenge in an era where spoilers and solutions are readily accessible to impatient audiences. Perhaps Garley himself will give a fuller explanation of the story in time. In the meantime, Late Fees is limited to 666 copies, so if you’re hankering for an enigma wrapped in a low print-run book, this is a place to look. Rating: Three death masks out of five.